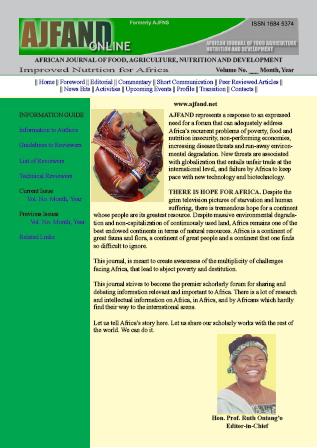 In sub-Saharan African countries, diets of pre-school children are predominantly based on starchy foods with little or no animal products and few fresh fruits and vegetables. A cross-sectional survey was carried out in Gitega health zone (Burundi) and Butembo health zone (Democratic Republic of Congo–DRC) with the objective of establishing dietary diversity and nutritional status of pre-school children from rural-banana dependent households. The two health zones were selected based on high dependency on bananas and plantains and the high levels of food insecurity. Through multi-stage random sampling commune/collectivity, colline/localite and villages were selected from each of the health zones; household listing was done in each of the sub-sites and systematic random sampling used to select 281 households with pre-school children (Butembo- 138 and Gitega- 143). Dietary diversity was assessed using the dietary diversity score (DDS) with a reference period of 24 hr. Anthropometric measurements were taken and Epi Info 2002 used to compute nutrition indices and results classified according to World Health Organization 2006 cut-off points. Findings showed that 48% and 42% of the children from Butembo (DRC) and Gitega (Burundi) respectively had consumed food items from less than 3 food groups. Only 7% and 29% of children from Butembo (DRC) and Gitega (Burundi), respectively had consumed highly diversified diets (>6 food groups). In both countries the most popular food group was the roots, tubers and bananas group (>75% consumption rate). The other popular food groups were; vegetables group, cereals and grains group in Gitega (Burundi) and vegetables group and legumes group in Butembo (DRC). In both countries less than 15% of the preschool children consumed food from meat, eggs or milk groups. Stunting was the most prevalent form of malnutrition with 63.57% and 78.86% of the preschool children from Gitega and Butembo, respectively being stunted (z-scores of ≤-2), while 20% and 3.25% of children from Gitega and Burundi, respectively were wasted. The differences in levels of underweight and stunting among children from Gitega and Butembo were not statistically significant but the differences in wasting were significantly different at a P<0.05. With the high levels of malnutrition and low dietary diversity observed among rural-Musa-dependent households in Gitega and Butembo, it is important that stakeholders work collaboratively in coming up with sustainable integrated approaches that link agriculture, nutrition and health in order to enhance the livelihoods of these communities.